Oswald Brierly, a celebrated marine painter, studied navigation and naval architecture in Portsmouth, England and exhibited his paintings at the Royal Academy, London, before joining Benjamin Boyd, the merchant adventurer, on his voyage to Australia in 1841. 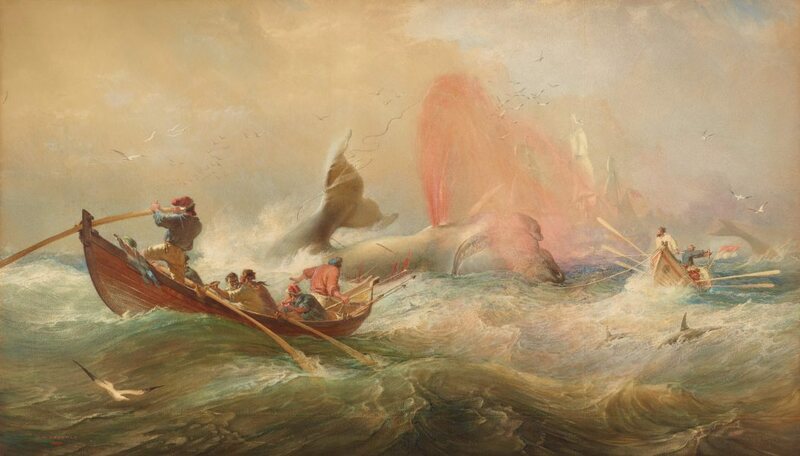 Brierly managed Boyd's whaling enterprises at Twofold Bay, Eden, on the south coast of NSW until 1848, an experience that provided the subject for this major watercolour, painted after his return to England in 1851. An earlier related version, 'The death flurry' 1865, is in the National Library of Australia, Canberra. "It so happened that I was in the boat wh[ich] was the first to come up with the whale wh[ich] we had sighted. After the [harpooner] had successfully cast his [harpoon] and fastened to the whale it turned towards us & made a dive – him coming to the surface exactly under our boat. I shall never forget the new & sickening sensation of finding the whole boat suddenly lifted out of the water by the rising back of the whale, and the sliding gliding helplessly slipping motion of the boat as it shot down the back of the monster under us. The powerlessness of the situation flashed through the mind – oars were of no use. We were literally 'out of our element' but truly only for a moment and then as we touched water again down came the great tail of the enraged monster cutting our boat in twain with one smashing blow as a hatchet would chop a pat of butter and in a moment the whole party were plunged into a boiling eddy of foam & water made by the whale as it plunged into deep water & left us struggling for dear life, & handicapped by a thick coat and sea boots – Luckily for us assistance was at hand and beyond a ducking and a fright none of us were any the worse for the novel experience". Signed and dated l.l. corner, red watercolour "O.W. BRIERLY/ 1867". R.T. Carter, pre 1901, Sydney/New South Wales/Australia, Robert Thomas Carter of Claines was the principal dealer of Brierly's work in late 19th-early 20th c in Australia.